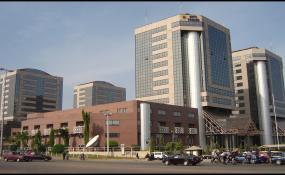 Abuja — The Senate on Tuesday resolved to probe the alleged mismanagement of $3.8 billion Subsidy Recovery Fund, SRF, by the Nigeria National Petroleum Corporation, NNPC. This is sequel to a motion moved at plenary by the Minority Leader, Senator Biodun Olujinmi, who came under Orders 42 and 52 to draw the attention of the Senate to the alleged mishandling of $3.8 billion Subsidy Recovery Fund,SRF, in the custody of the NNPC. The Senator while speaking on the matter of urgent national importance accused both the Managing Director and an Executive Director of the NNPC as sole signatories to the Fund "without recourse to the National Assembly Joint Committee on Appropriation". The Account, she said, has become a slush fund and therefore urged the Senate to compel its Committee on Petroleum(Downstream) to ask the NNPC on why the Fund was being managed by the Executive without the knowledge of the Legislature. Contributing, Senator Ali Ndume, opposed the suggestion that the Committee on Petroleum(Downstream) be allowed to look into the matter saying " that call may not be necessary because if the committee had done its oversight properly it would have known what was going on with the Fund". Senator Ndume who sat close to Senator Buka Abba said he had just been told by Abba "that the Committee had compromised. The Chairman of the Committee on Petroleum(Downstream) Senator Kabir Marafa, was quick to respond by saying he took exception to Senator Ndume's reservation about his committee's competence although he also alluded to the fact that the said money may have become a slush fund. Senate President, Bukola Saraki, while accepting the need to look into the matter however stressed the need for the upper legislative chamber to be guided by facts and figures. "Let us go by the fact available before us on this matter and will not want us to be partisan", he further said. The Senate President then named the Senate Leader, Senator Ahmad Lawan, as the Chairman of an Ad-hoc committee that will look into the matter and report back to Senate in four days. The Senate Leader in reaction said he would decline to serve on the Committee but was overruled by the Senate President who said " Leader of Senate there is no way you can exonerate yourself from leadership so you will chair the ad-hoc committee". The Senate also on Tuesday approved the N242 .245billion budget for conduct of the elections by the Independent National Electoral Commission ( INEC) and security agencies. The Senators altered election budgetary proposals made for the Nigeria Police Force (NPF), the Department of State Service (DSS) and office of the National Security Adviser (NSA) . While the Police in the original proposal forwarded to the National Assembly by President Muhammadu Buhari through a virement seeking letter in July has N30bn earmarked for it, Senate approved N27.341bn for it just as it also reduced the N12,213,282,455.00bn proposed for DSS to N10.213bn . The N5bn raked from Police and DSS earlier budgetary projections for the elections were however added to N4,281,500,000.00bn earmarked for the office of the National Security Adviser jerking it up to N9.481bn . The N189bn budgetary proposals for INEC, N2.628bn for National Immigration Service (NIS) and N3.573bn for the Nigeria Security and Civil Defence Corps, were however retained and approved as requested fby the President . Approvals of the N242.245bn elections budget for 2019 by the Senate was sequel to recommendations made to that effect by its Appropriation committee. The Committee in its report presented at plenary by its Chairman, Senator Danjuma Goje, also differed with the president on source of virement for the N242bn . While the President in his July letter, urged the federal lawmakers to vire the money from the N578bn special votes they allegedly inserted into the N9.12trillion 2018 budget through addition of about 1,403 projects, the Senate in its approval of the N242bn elections budget, ordered for its virement from Special Intervention Programme ( both recurrent and capital). Specifically, N194.7 bn out of the N242bn would be vired from N350bn recurrent component of the Special Intervention Programme while the balance of N47.498bn would be vired from N150bn capital component of the Special Intervention Programme . Breakdown of the N242bn 2019 elections budget as proposed by President Muhammadu Buhari in the virement seeking letter include Independent National Electoral Commission (INEC) N189,207,544,893.00bn; Office of the National Security Adviser (ONSA) N4.281bn; Department of State Security (DSS) N12.213bn; Nigeria Security and Civil Defence Corps N3,573,534,500.00bn; Nigeria Police Force N30,541,317,432.00bn and Nigeria Immigration Service N2,628,143,320.00bn. In his remarks, the Senate President said : " the much expected elections budget has been passed and approved here in the Senate.
" It is the hope of the National Assembly and Nigerians generally that with this approval, INEC and other relevant agencies will ensure credible , free, fair and safe elections come 2019', Saraki further said.